On Friday, March 2nd, Alton Elementary School celebrated Career Day. 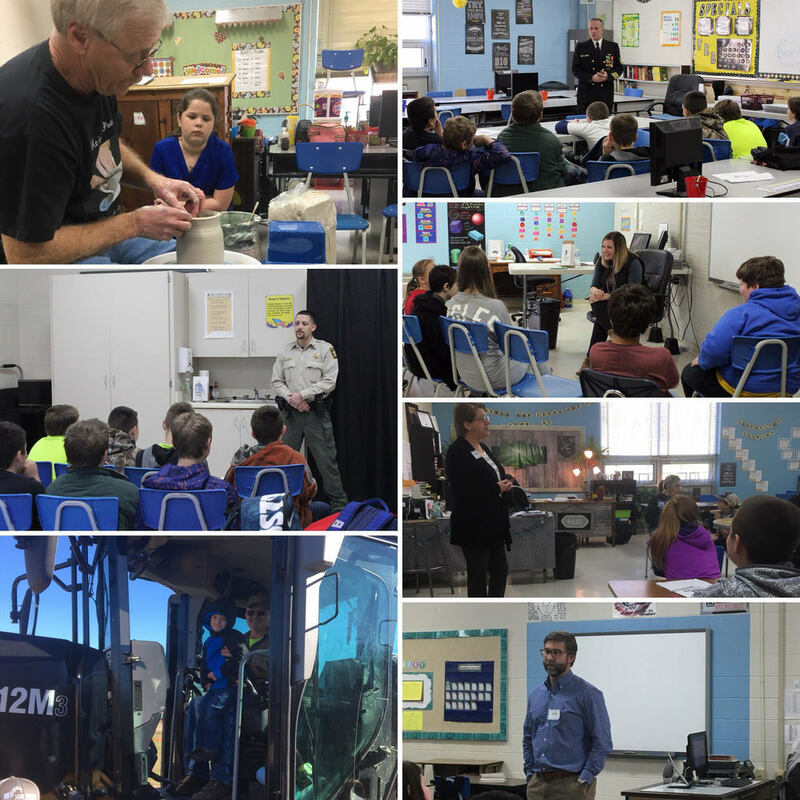 Throughout the day, students had the opportunity to participate in a variety of career focused activities. All of the activities were designed with the purpose of introducing students to many professions, helping students understand the importance of learning, and providing role models for students to look up to. Students in 5th and 6th grades attended career focused presentations. Students chose 6 presentations each to attend. Pam Proffitt-Rowland, retired Ag teacher and current Coordinator of Recruitment and Retention for Mo Ag Education, talked to students about careers in Agriculture. Justin Mitchell, the owner of Colton’s in West Plains, spoke with students about working in the food services industry. Randy Ingram did a live pottery presentation with students, complete with clay and a pottery wheel. Oregon County Deputy Dustin Kirkpatrick talked to students about a career in Law Enforcement. Local Author Debbie Clark spoke with students about writing. Chad Sisco, owner of Paint Masters Collision Repair, discussed auto body work with students. Karen Bridges owns her own nail salon and talked to the students about her career, as well as other careers that require trade school. Chris Johnston is a retired Navy Chief Petty Officer. He talked to students about a career in the military. Kandy Fuselier is a Registered Nurse who works for Air Evac as a flight nurse. She and Kate Lyons, Air Evac Paramedic, talked to students about their exciting careers at Air Evac. Oregon County Commissioners John Hollis, Patrick Ledgerwood, and Jason Kemper, along with a few members of their crew, brought heavy machinery equipment for students to view and talked to students about their work for the county. Students in grades Preschool through 4th spent time learning about Community Helpers. The Air Evac, Fire Truck, Ambulance, and Police Truck were all on campus for these students to view. Students were also able to explore their interest in working with animals by participating in a live petting zoo hosted by the Alton FFA Chapter. Career Day proved to be a huge success! Alton Elementary would like to thank everyone who helped make the day special for Alton students! Without community involvement, the day would not have been possible! The students and staff are incredibly grateful to all who took time out of their schedules to help!